Editor’s note: Under a trade deal concluded in May, China has begun exporting chicken to the United States. Critics have pointed to China’s record of food safety issues and argued the deal prioritizes commerce over public health. Here Maurice Pitesky, a poultry extension specialist at the University of California, Davis School of Veterinary Medicine with a focus on poultry health and food safety epidemiology, answers five questions about importing Chinese chicken. Why is the United States importing chicken from China? Do we have a shortage? Hardly. The United States is the largest poultry producer in the world, and the second-largest poultry exporter after Brazil. 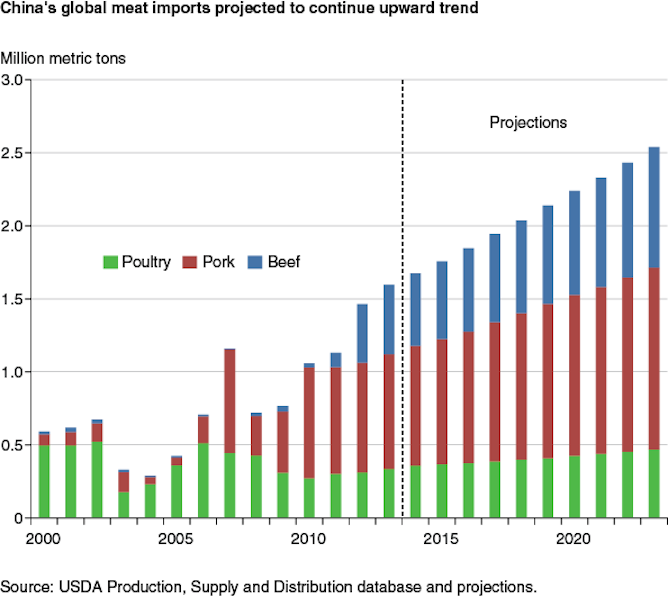 However, as part of a recent bilateral trade deal, China has agreed to accept imports of beef and liquefied natural gas from the United States. In exchange, the United States is allowing China to export cooked poultry meat to the United States. Why can China send us only cooked chicken? This is most likely in response to concerns over avian influenza transmission from raw poultry to the United States. Viable avian influenza viruses could potentially infect U.S. poultry or birds and spread these novel viruses in North America. Some of these viruses can infect humans. 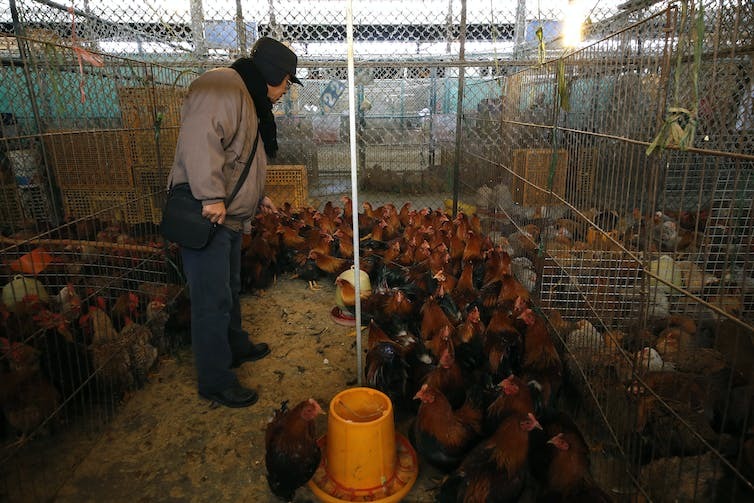 South and Southeast Asia have dense human populations, with numerous poultry producers, vendors and markets where people are exposed to live birds – all conditions that contribute to the spread of avian flu. Since 2013 China has confirmed 1,557 human cases of AH7N9 flu and 370 deaths. Given China’s history of food safety problems, should US consumers be worried about eating chicken processed there? China is already the third leading supplier of food and agricultural imports to the United States. U.S. consumers are eating imported Chinese fish, shellfish, juices, canned fruits and vegetables. If poultry is cooked properly, there is no food safety risk from viruses or bacteria. 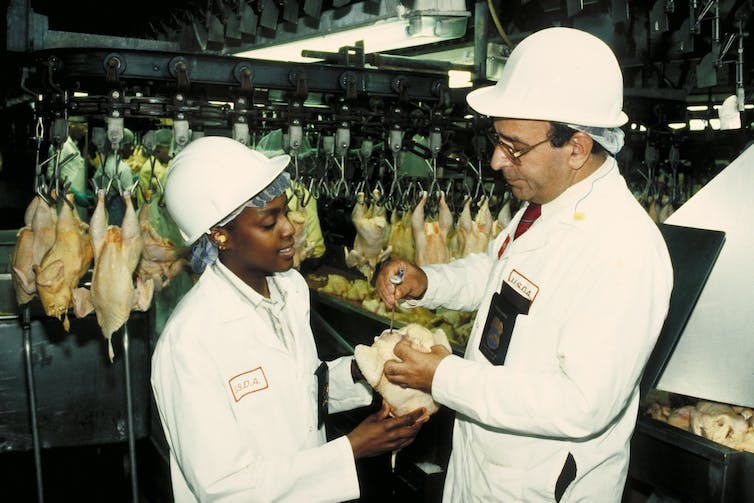 However, if the poultry is not cooked properly, or if there is some type of cross-contamination – for example, if raw chicken or feathers come into contact with cooked product or packaging material – then zoonotic bacteria like salmonella and campylobacter can cross the species barrier and sicken humans. Most cases of salmonellosis and campylobacteriosis are thought to be associated with eating raw or undercooked poultry meat, or with cross-contamination of other foods by these items. There are no publicly available data on rates of salmonellosis and campylobacteriosis in China. In the United States, infections from these two bacteria sickened nearly 14,000 people in 2014. Of this group, 3,221 were hospitalized and 41 died. Poultry meat can also contain contaminants, such as heavy metals, and antibiotic residues if birds are treated with antibiotics in an inappropriate fashion. Specifically, when poultry farmers use antibiotics inappropriately (quantity, type and timing), residues can persist in muscle, organs and eggs and toxic and harmful residues build up in the birds. These risks are probably greater for poultry raised and processed in China than for poultry raised and processed in the United States. Here in the United States there are strict rules requiring growers to stop giving birds antibiotics for periods of days or weeks before they are processed, and we have a National Residue Program that is designed to test for these compounds in eggs and meat. China has similar rules, but they are not robustly enforced, and many poultry farmers are not well-informed about them. The Chinese government recently announced a plan to increase surveillance, oversight and monitoring of poultry, livestock and aquatic products to decrease the presence of antibiotic residues by 2020. Heavy metals in Chinese poultry products may also be an issue. This is a worldwide concern, but it’s especially serious in China because they still burn huge quantities of coal, which releases lead, mercury, cadmium and arsenic. High levels of lead and cadmium have been reported in agricultural areas near Chinese coal mines. These heavy metals can contaminate soil and end up in animal feed and animal meat and eggs. We really don’t understand how widespread these problems are in China and the Chinese government isn’t very transparent about food safety. That’s starting to change, but there’s nothing like the publicly available data that we have in the United States at the processing plant and retail level. What will US inspectors do to determine whether Chinese chicken is safe? The U.S. Department of Agriculture’s Food Safety Inspection Service is responsible for determining whether other countries have meat and poultry safeguards that are equivalent to ours. Chinese poultry processing plants cannot ship cooked poultry to the United States unless they meet that test. When a foreign program is approved by the USDA, the Food Safety Inspection Service relies on that country’s government to certify that its plants are eligible and conduct regular inspections of the exporting plants. The Food Safety Inspection Service conducts on-site audits of the plants at least annually to verify that they are still meeting the required standards. It will be interesting to see whether the U.S. National Residue Program is involved in those inspections. Where will chicken processed in China show up in US markets? This is the million-dollar question. Cooked poultry is considered to be a processed food item, so it is excluded from country of origin labeling requirements which would apply to raw chicken. This means that U.S. consumers will not know they are consuming chicken grown and processed in China. Restaurants also are excluded from country of origin labeling, so the cooked poultry could be sold to restaurants without consumers knowing. The first Chinese exporter did not specify the name brand that its cooked chicken is being sold under. The key issue is cost competitiveness. If China can sell cooked poultry at a competitive price point, there will most likely be a U.S. market for it. At this point, though, the Chinese poultry industry is not as integrated (that is, organized so that one company owns breeder birds, hatcheries, grow-out farms and processing plants) or technologically advanced as the U.S. poultry industry. In the short run this makes it difficult for China to compete with the U.S. poultry industry at any appreciable level, even though Chinese labor costs are lower. Visit elsevier.com to access content on food safety and more! Use discount code STC317 at checkout and save up to 30% on your very own copy!